Written on 16 June 2013 . ​After five days of exciting competition, the National Youth traditional martial arts (Vovinam) Championship 2013 officially closed on June 12 in the central province of Quang Ngai. 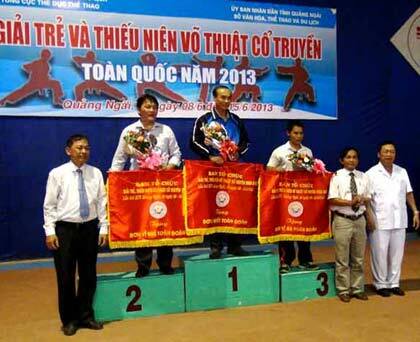 ​The event was co-organized by the Vietnam Traditional Martial Arts Federation and the Quang Ngai provincial Department of Culture, Sports and Tourism from 8 to 12 June at Dien Hong Sports Centre, Quang Ngai city with the participation of 300 young athletes from 30 provinces, cities across the country. They competed for 27 sets of medal in combat and 22ones in eight performance events. As a result, the first prize was awarded to Vovinam team of Ho Chi Minh city with 12 gold, 4 silver and 2 bronze medals; the Second prize to Binh Dinh province with 7 gold, 6 silver and 7 bronze medals. With 4 golds, 6 silvers and 2 bronzes, Quang Ngai Vovinam team was ranked 4th. The annual event is considered a good chance for young athletes to test their skills and learn more experience from each other. It also aims to promote traditional martial arts among young people and select outstanding talents to prepare for upcoming national and international competitions.